Next week ROCCAT will uncover its new Kone XTD gaming mouse at Computex in Taipei and at E3 in LA. 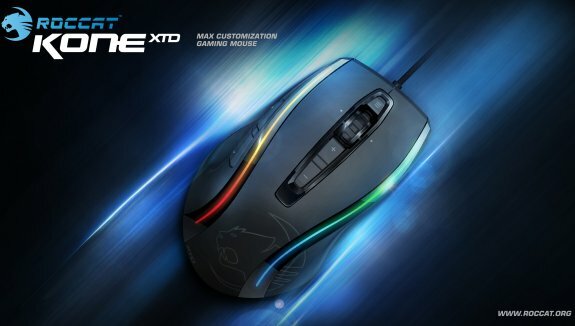 German gaming peripherals manufacturer, ROCCAT Studios, will unveil one of the most powerful gaming devices ever – and successor to the world famous Kone[+] – with the sneak preview of the ROCCAT Kone XTD Max Customization Gaming Mouse at the E3 expo in Los Angeles and the Computex expo in Taipei on June 5. Extending the already formidable capabilities of the legendary Kone[+], the XTD is powered by an impressive performance package loaded with the latest 8200 DPI Pro Aim R3 laser sensor, a 32-bit Turbo Core 2 72MHz ARM MCU processor, and the world’s most advanced Tracking & Distance Control Unit – all working in clockwork unison to deliver world-beating battle ability. It also features a new mega-tough, ultra- precise scroll wheel designed to let gamers give every command with absolute accuracy. Add to that a range of ergonomic features designed to deliver the longest play comfort, like No-Sweat side grips for extended slip-free play, a finger-pampering soft touch surface – as well as a suite of the world’s most advanced gaming software for max customization – and the Kone XTD promises to be the Hamburg- based company’s most powerful gaming mouse to date. The Kone XTD also comes standard with many exclusive features much loved by Kone[+] fans, including Easy-Shift[+] technology, which lets users double the functions of their buttons and wheel, and ROCCAT Talk, which lets the XTD communicate with compatible products – like the ROCCAT Isku Illuminated Gaming Keyboard – to provide “set bonus” gaming advantages that let gamers play faster and with more accuracy. The Kone XTD even comes loaded with the new ROCCAT Achievements Display – or R.A.D. – a fun and useful app that tracks a wide range of gaming statistics for analysis and hands out trophies when exceptional milestones have been reached. The Kone XTD is expected to hit shelves internationally September 2012. Select E3 and Computex visitors can test drive the XTD at ROCCAT booths.